Can practical and functional be elegant and stylish? In the case of concrete, yes! Once considered a boring basic construction material, concrete is now a popular and trendy element in interior design, not just for Modern style home plans but for styles like Craftsman, Farmhouse, and Beachfront house plans. From kitchen countertops and sinks to tables, benches, and lighting fixtures, concrete is high style. 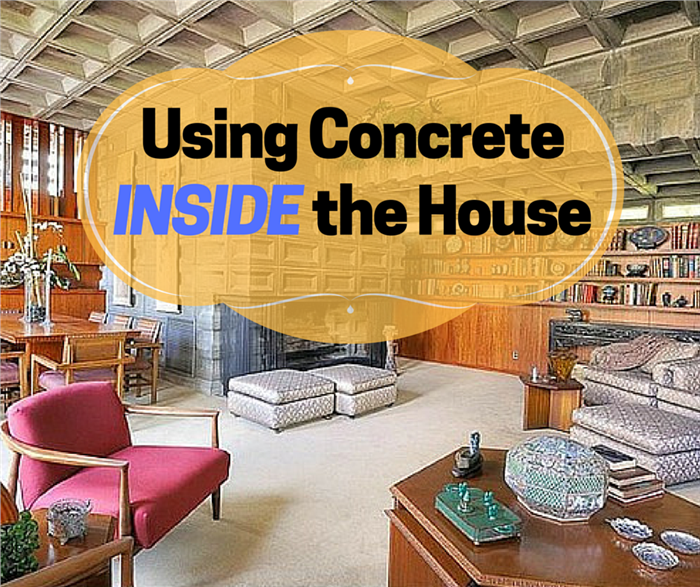 We take a look at some uses for concrete inside the home floor plan. 1. 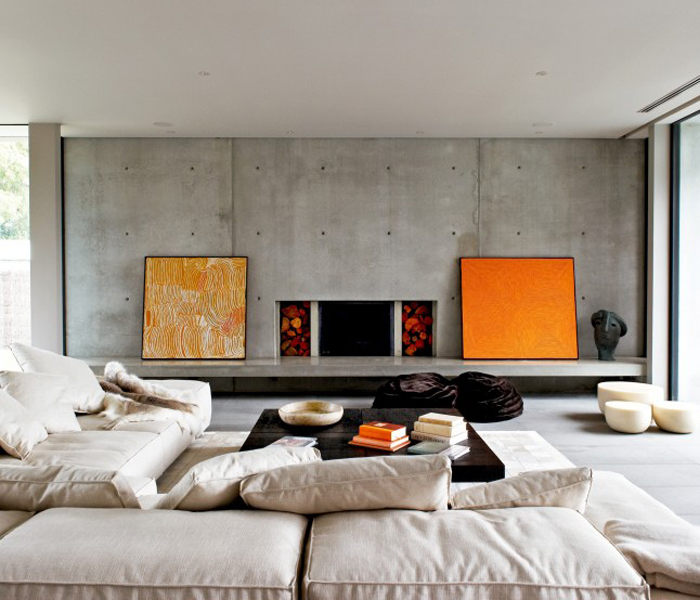 Walls – In today’s home, concrete is not just for the exterior facade. 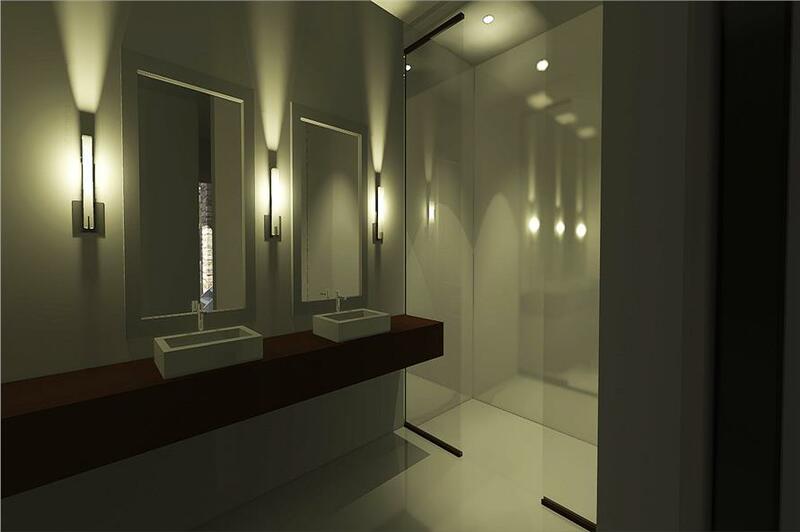 Its industrial but elegant look has found its way in interiors of homes and apartment units. And in a number of contemporary home floor plans, adventurous owners are making a bold and unique statement by installing concrete walls in their living rooms. 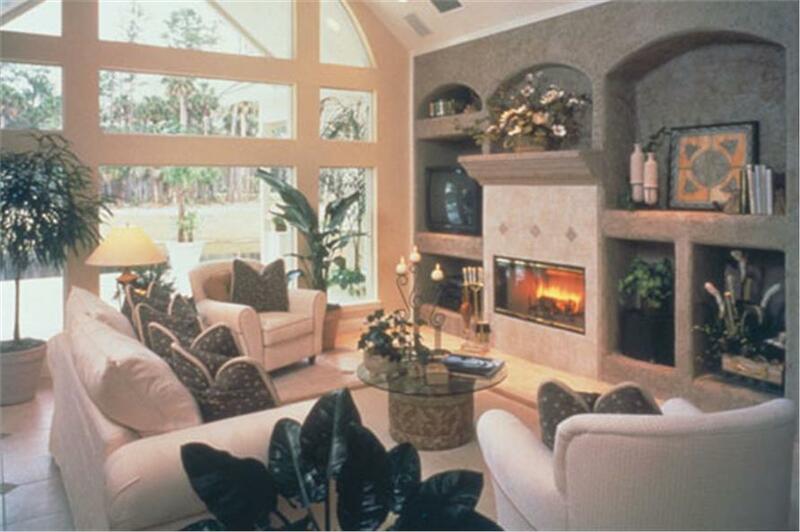 A concrete wall with a fireplace is the focal point of this modern living room. Two frames in shades of orange and an art object adorn the wall. 2. Floors – Think of your concrete driveway – then, imagine it all touched up and polished – and you get a picture of concrete floors in home plans, restaurants, and commercial buildings. Because it is easy to clean, durable, and inexpensive compared with other floor surfaces, concrete is the preferred material in spaces that have high foot traffic. 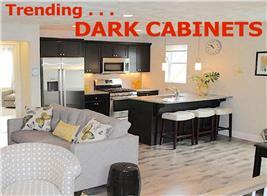 And keep in mind that these concrete floors are not your standard run-of-the-mill grayish-white basic. They can be touched up with stains, dyes, paints, and decorative overlay to make them more attractive and appealing – just perfect for today’s home. 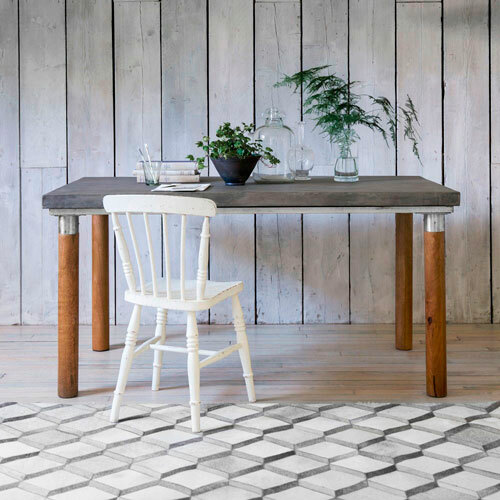 Transform your floor from boring to eye-catching. 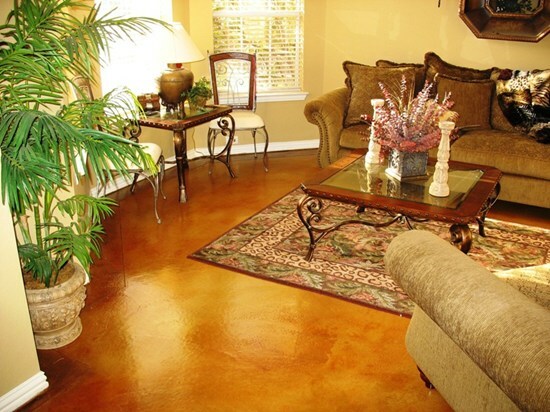 A stained concrete floor adds color and vibrancy to this living room. 3. Lighting Fixtures – From walls to floors to fixtures such as lights, lamps, and lanterns, concrete can be formed to be visually striking and dramatic. 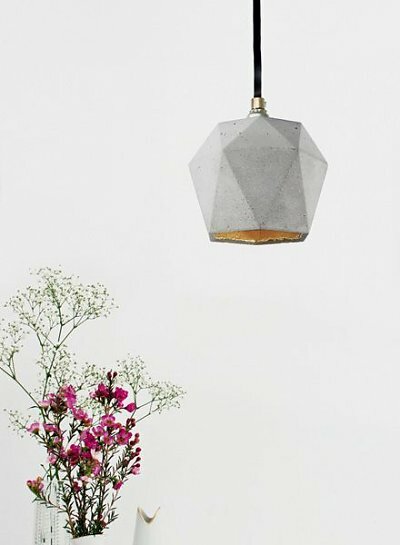 In fact, architects and artisans have created intriguing and fascinating concrete lighting designs, including some amazing desk and hanging lamps. Make a statement with minimalist designs. 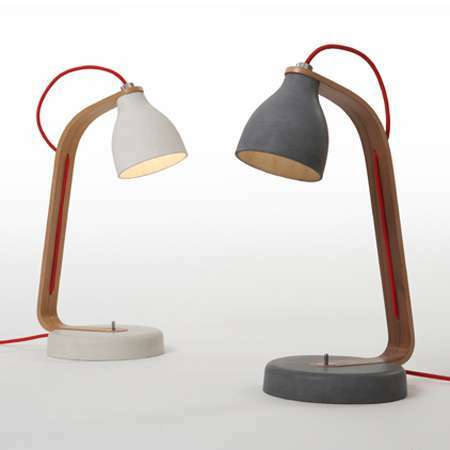 A concrete base and shade combined with a wooden stand give these simple desk lamps a classic touch. Left: How can something as heavy as concrete look so light? 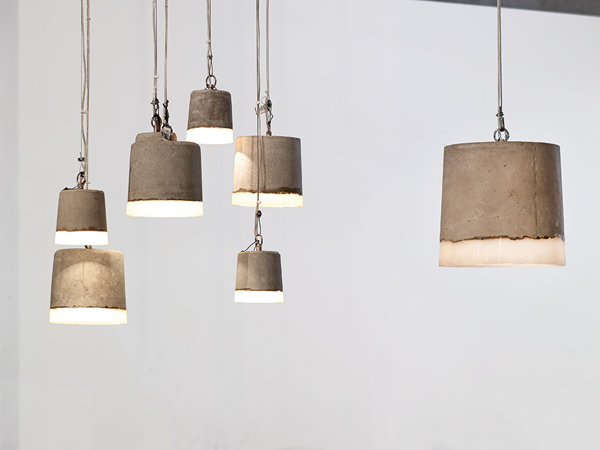 Concrete pendant lamps in varying sizes seem to float from the ceiling. Right: All the decor you need: a simple concrete hangin lamp over a colorful flower arrangement is attractive and elegant. 4. Built-in Shelves – One can never have enough storage space in the home. And today, concrete is a top choice when constructing built-in shelves to store books, china, silverware, toiletries, and knick knacks. It’s weather-resistant, stands up to wear and tear, and can be formed into many shapes and patterns. An interesting built-in shelf – made of a concrete-like material and filled with decorative displays – completes the homey touch in the family room of a two-story, four-bedroom Southern/Concrete Block style home (House Plan #190-1004). How would you like this very modern and trendy concrete built-in shelf in your home? 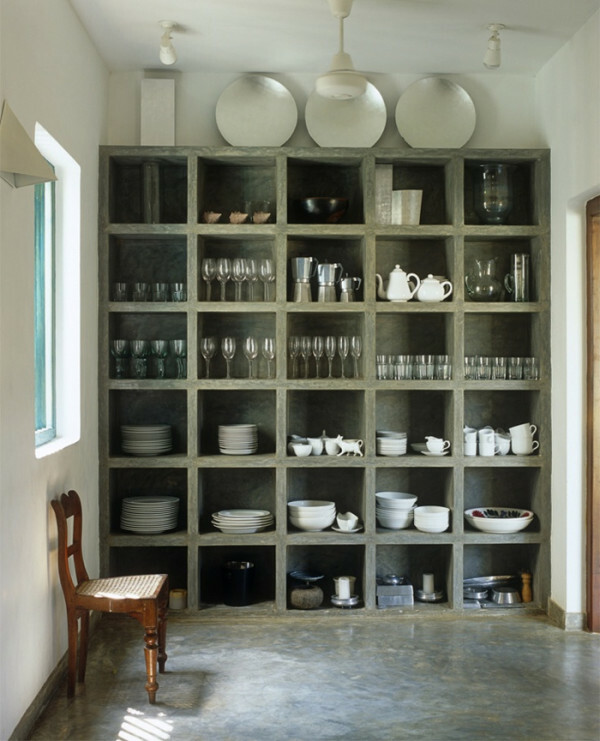 Take a look at all the cubby holes that store glassware, china, cookware, and kitchen utensils. 5. Kitchen Countertops/Kitchen Islands – While granite continues to be the gold standard in kitchen countertops and has remained a constant design trend for decades, concrete is gaining momentum in the industry and is becoming quite the rage. So if you’re looking to renovate your kitchen, why not consider concrete and its many qualities that are ideal for a kitchen countertop/ kitchen island? 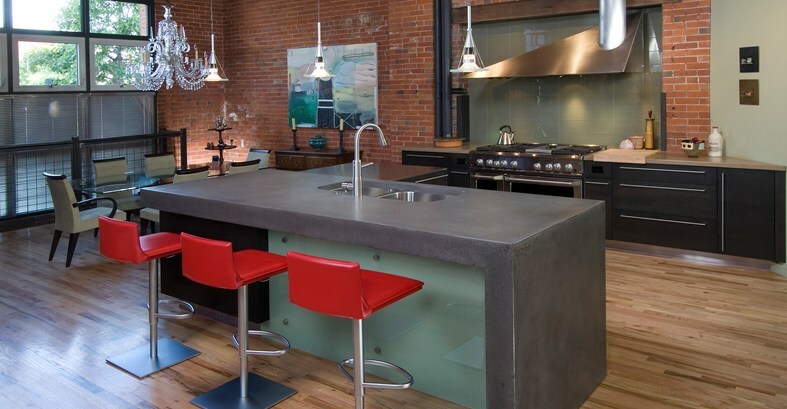 A gorgeous contemporary kitchen features an island with a concrete countertop. The red bar stools add a splash of color to the space. 6. Benches/Stools – You can go thoroughly modern by placing concrete-topped benches and stools in your front hallway or living room. 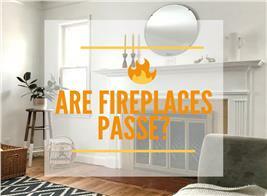 They are attractive, built-to-last, and low maintenance. A concrete-topped stool and side table can be appropriate accent pieces in any home – be it an edgy contemporary/modern style or a quaint and laid-back Southern/Ranch/Mountain house plan. 7. 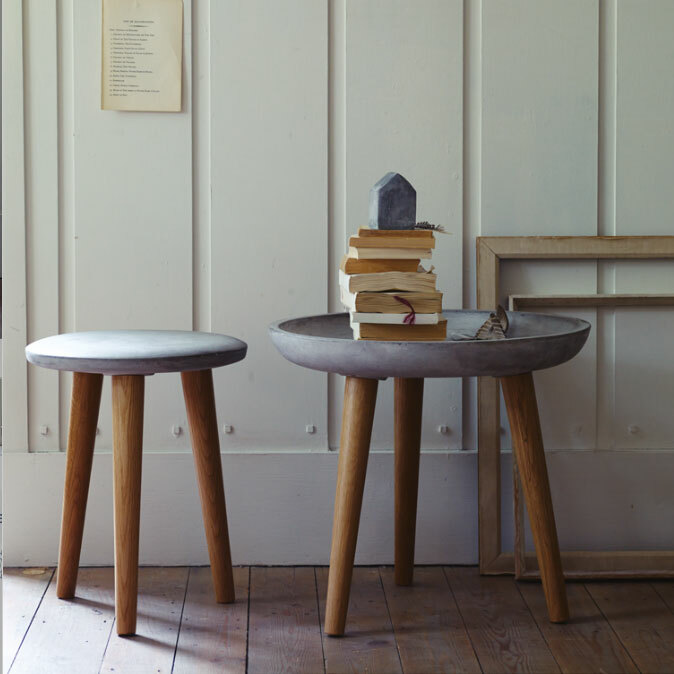 Tables – Complete the look of your furniture scheme with concrete-topped tables – and cover the range: from coffee, dining, and kitchen to cocktail, accent, and end tables. 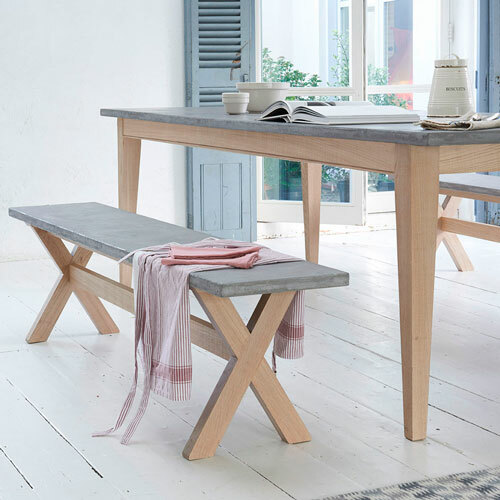 This concrete-topped-andwood kitchen/dining table comes with matching concrete-topped benches. This concrete-topped dining table – the centerpiece of this room – complements the muted but warm tones of the color scheme. 8. Bathtubs – From the kitchen and dining area, we move to the bathroom, where concrete soaking tubs are getting to be popular and trendy fixtures. 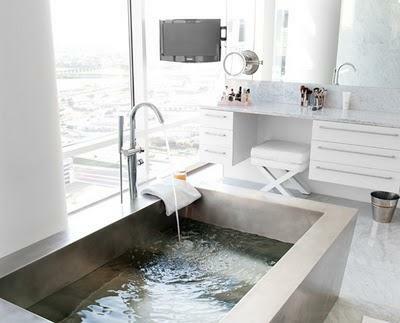 The concrete bathtub is just the right thing in this very modern bathroom, which also comes with a white vanity. 9. Sinks – Much like tubs, concrete sinks are also in demand in the home improvement industry. If you have a concrete soaking tub in the master bathroom, go for concrete sinks to match the overall look. This 3D illustration depicts concrete vessel sinks in the master bath of a 4-bedroom, 3.5-bath, multi-level Modern style home plan (House Plan #116-1080). 10. Planters – Accessory items like flower vases and planters are also getting the concrete look. A popular idea is the use of concrete planters that come in different designs and colors. White on white with a dash of color paints a sophisticated picture. 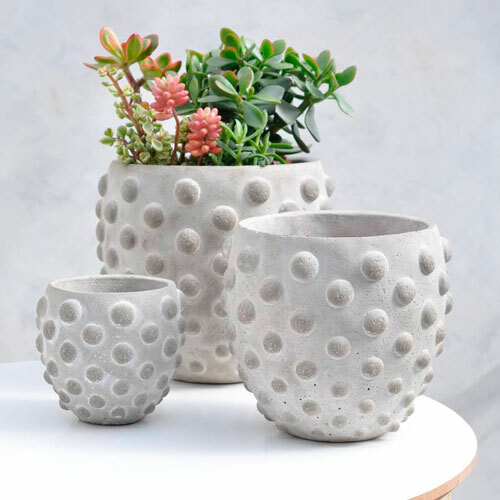 Decorative concrete planters – one filled with pink, orange, and green blooms – adorn a side table and break up the monochromatic palette of the room. 11. 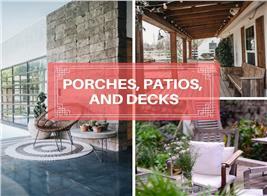 Cheap Chic Pieces – Call them hollow blocks, concrete masonry units (CMUs), or concrete blocks. Lighter than solid concrete but reliable, strong, and quite cheap, hollow blocks are used to create a lot of fun and inexpensive “do-it-yourself” projects. Stack them up to build wall planters, shelves, benches, nightstands, and other “cheap chic” items. 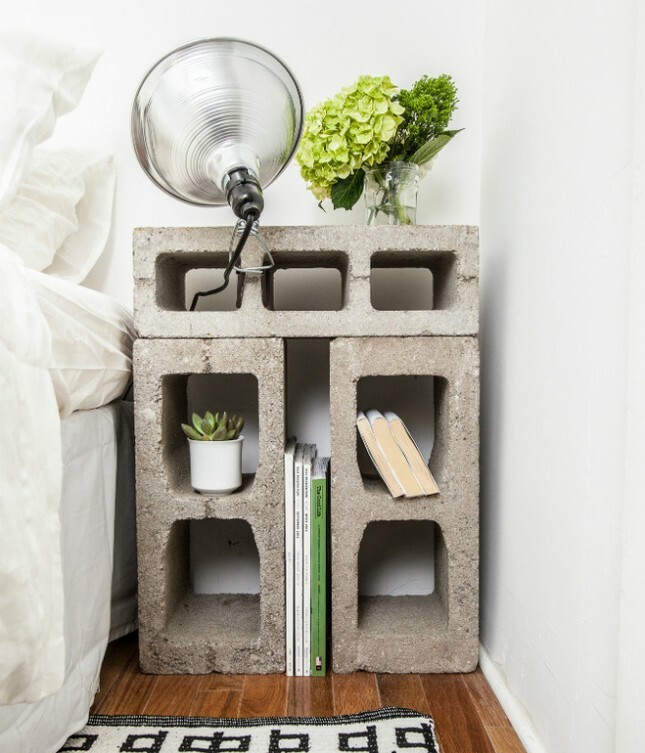 Three concrete blocks are stacked together to form a functional but interesting nightstand in a small apartment in New York City. Get over the image of those rough and cracked concrete sidewalks … and think of all the wonderful, beautiful, and amazing possibilities of concrete in home interiors! Footnote: The lead image in this article is the Great Room of a three-bedroom concrete home designed by Frank Lloyd Wright, who used “11 different patterns of concrete block with over 400 inset windows to create a one-of-a-kind indoor/outdoor light show.” For more information, click here.